Alberto Rigoni is an italian bass player and composer who's rapidly gaining audience in the international music scene thanks to his modern and fresh sound, far away from any well known music clich?. 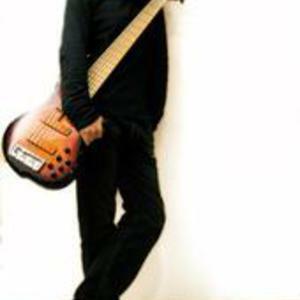 Besides his solo career, Alberto is also known as member and bass player of the progressive metal band TwinSpirits and founder of the new pop electro duo Lady & the BASS. Born in Montebelluna (Treviso, Italy) in 1981, bass player Alberto Rigoni founded, together with drummer Enrico Buttol, a well-known progressive-metal cover band, "Ascra", performing mainly songs by Dream Theater. Besides his solo career, Alberto is also known as member and bass player of the progressive metal band TwinSpirits and founder of the new pop electro duo Lady & the BASS. Born in Montebelluna (Treviso, Italy) in 1981, bass player Alberto Rigoni founded, together with drummer Enrico Buttol, a well-known progressive-metal cover band, "Ascra", performing mainly songs by Dream Theater. In 2003 he joined the emerging band "Twinspirits" (progressive rock metal), led by Daniele Liverani (Genius Rock Opera, Khymera, ex-Empty Tremor). The band's debut album "The Music That Will Heal The World" was released worldwide in 2007 by Finnish label Lion Music and received remarkable feedback. Besides Twinspirits, Rigoni followed a very personal artistic way, composing a solo album entitled "Something Different", released by Lion Music on February 15th 2008 with worldwide distribution. At the same time Alberto shot a video of his hit song ?BASSex? (working with Italian company ?Solingo Visual Arts?) directed by Elia Cristofoli. The video was broadcast on some television networks such as RockTV.